Many of the recent electoral campaigns, on both sides of the Atlantic, can be depicted as confrontations between the friends and foes of globalisation, between those who support the free movement of people, goods and capital, and those who disagree with these, preaching the virtues of closer societies, often using populist slogans. While there is little doubt that, in the last decades, the world has become more globalised, no matter how one measures globalisation, it is less clear whether the globalisation process is continuing, and thus whether the populist wave we are observing reflects current trends or, rather, is a long-lasting consequence of the mistrust in market forces that followed the Global Crisis. In a recent column, Forbes et al. (2016) argued that globalisation is in retreat both when one looks at trade and at capital flows. In particular, they show that financial deglobalisation is a by-product of banking deglobalisation, which, in turn, reflects the interaction between unconventional monetary and regulatory policies. While banking deglobalisation is an important phenomenon, it is unclear whether from it one can infer that financial globalisation is also in retreat. To make such a claim, it would important to also look at prices, and see whether the correlation between asset prices is also decreasing. In our view, if the correlation between the asset prices of one particular country and the rest of the world decreases, then it is clear that the country becomes less financial globalised, less prone to suffer from external financial shocks, and less able to diversify domestic risk. The opposite is true if asset prices correlation increases. No matter how one measures it, financial globalisation has an important bearing on the way countries are affected by and cope with internal and external shocks; this is why it plays such an important role in the policy debate. What is less evident is whether, and under which circumstances, a country, or group of countries, is more likely to take advantage of or undergo the effects of financial globalisation. Ultimately, what is the relationship between financial globalisation and financial market volatility? Using the unadjusted measure, one would conclude that, during the period previous to the 2008 crisis, developed markets integrated at a faster pace than emerging and frontier markets, and that after the crisis all country groups entered in a deglobalisation phase. Instead, using the adjusted measure (FGI) one realises that, before the Global Crisis, countries with less-developed financial markets were converging towards those with more developed ones; that the crisis further narrowed the difference in financial globalisation between country groups (mostly because of the sharper drop in developed markets); and that when the effects of the crisis started fading away, developed and emerging markets recovered towards their pre-crisis levels, while frontier markets apparently entered a deglobalisation phase. Our analysis suggests that one of the reasons behind the mixed evidence could be that the effects of financial globalisation on stock market volatility are different in tranquil and in turbulent times. In tranquil times, financial globalisation reduces the volatility of stock returns; in turbulent times it increases it. Overall, we find that negative shocks of the magnitude required for financial globalisation to yield an increase in financial instability are quite infrequent, and thus that financial globalisation is associated with an average decrease in stock market volatility. When we distinguish among country groups, we find that, on average, financial globalisation has no significant effect on stock market volatility in developed markets, while it decreases it in emerging and frontier markets. Hence, our evidence suggests that financial globalisation is more likely to be a stabiliser the less financially developed a country is. One of the reasons why the effects of financial globalisation differ across countries is that they may be affected by both the frequency and magnitude of domestic shocks relative to external ones. When domestic shocks dominate, financial globalisation provides diversification opportunities; when external shocks dominate, it may instead be a source of instability. In developed economies, domestic shocks are likely to play a relatively smaller role than in emerging or frontier ones. This can explain why financial globalisation, on average, is more likely to reduce stock market volatility in emerging and frontier than it does in developed markets. Bae, K H, K Chan and A Ng (2004), “Investibility and return volatility,” Journal of Financial Economics 71: 239-63. Cordella, T and A Ospino Rojas (2017), “Financial globalization and market volatility : an empirical appraisal”, World Bank Policy Research Working Paper No. WPS 8091. Forbes, K, D Reinhardt and T Wieladek (2016), “How the interactions of monetary and regulatory policies may have been ahead of the anti-globalisation backlash,” VoxEU.org, 23 December. Forbes, K J and R Rigobon (2002), “No contagion, only interdependence: measuring stock market comovements,” The Journal of Finance 57: 2223-61. Han Kim, E and V Singal (2000), “Stock market openings: experience of emerging economies,” The Journal of Business 73: 25-66. Pukthuanthong, K and R Roll (2009), “Global market integration: an alternative measure and its application,” Journal of Financial Economics 94: 214-32. The analysis includes 84 countries: 21 developed, 20 emerging, 36 frontier, and 7 that transitioned between groups. We compute the index in two stages. In the first, we estimate a global factor, the first principal component of the equity returns of the 20 biggest stock markets as of 2006. In the second stage, for each country and year we regress the daily returns of the stock market index on such global factor The R squared of these regressions are the UFGI. 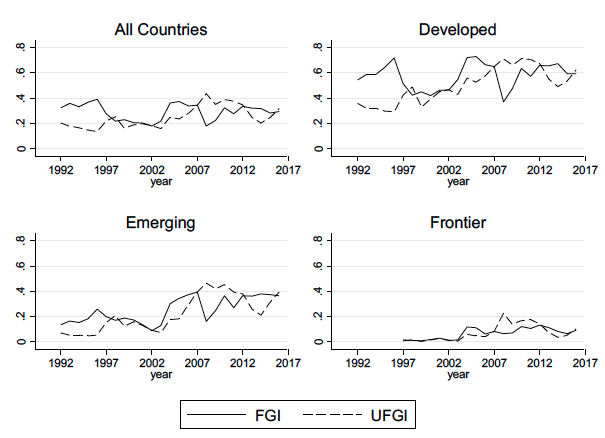 The FGI is computed by removing from the UFGI the variation that is driven by changes in the volatility of the global factor.